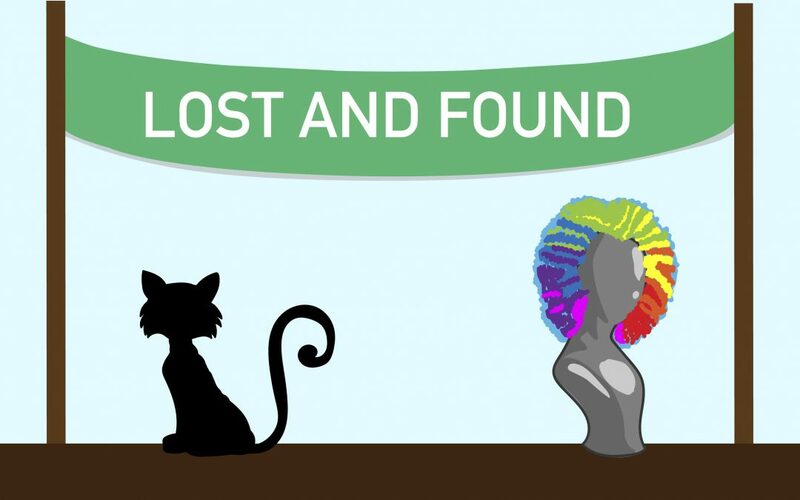 A cat, a painted bust and a backpack full of concrete are some of the strangest things the Lost and Found has recently received. According to Jessica Verdoorn, a junior studying animal science and an employee at the Lost and Found, all three items have a unique story behind them. A group of students brought the cat to the Lost and Found after finding it wandering around campus. “They didn’t know what to do with the cat, so they brought it to the Lost and Found,” Verdoorn said. Lost and Found staff was unsure of what to do with it either and they tried to contain it as best they could. “I literally held the cat for two hours,” Verdoorn said. The cat was later taken to the pound. A bust of a person’s head painted in rainbow colors was recovered in the Jacob Spori building. The janitorial staff brought it to the Lost and Found. The staff held onto it, but no one claimed it. “Someone lost a wig a little while later, and we put the wig on the bust,” Verdoorn said. Eventually, the Lost and Found staff tried to sell the bust at the Lost and Found sale, but no one bought it. “We just took it to Deseret Industries,” Verdoorn said. The backpack full of concrete was also recovered by janitorial staff. “They brought it in and said that they really wanted to see what was inside of it. We opened it, and we found two blocks of concrete inside,” Verdoorn said. A student came to the Lost and Found the next day to claim the backpack. “We really wanted to know why he had a backpack full of concrete, and he said he was using it for a church lesson,” Verdoorn said. Verdoorn said she enjoys seeing the different things turned in at the Lost and Found. “I like interacting with everybody and seeing all of the crazy stuff we get,” Verdoorn said. Fikerte Mekonnen, a sophomore studying nursing and another employee at the Lost and Found, said she has enjoyed working there. According to Mekonnen, water bottles and headphones are the most common items turned in at the Lost and Found. There has also been an increase in beanies and gloves turned in due to the winter weather. Items turned in are held for 60 days before they are sold at the Lost and Found sale. This semester’s sale will be held on February 22.